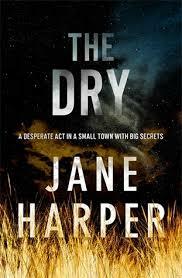 a book chick: "The Dry"
my take: A triple family suicide/murder in a small Australian farming town re-kindles the unsolved murder/suicide from twenty years earlier when the main character returns to town for the funeral of childhood friend. And I got the recommendation from Anne of Modern Mrs. Darcy. Fingers crossed that her new summer reading guide brings me another such good vacation read for sharing with you on the beach soon!